Whenever possible, we utilize minimally invasive techniques, so our patients experience less pain, less scarring, and a swifter recovery. Thyroid surgery is frequently performed for conditions that include an enlarged or hyperactive thyroid gland or a growth or tumor within the thyroid gland. Enlarged thyroid glands – also known as goiters – are those with or without multiple nodules or cysts, which are solid or fluid-filled growths. Sometimes goiter is associated with excessive amounts of thyroid hormone production (hyperthyroidism) or an underproduction of hormones, known as hypothyroidism. Often, hormone supplements or radiation can normalize thyroid hormone production and benign goiters can be monitored without resorting to surgical treatment. However, surgery may be required if the thyroid contains cancer, causes cosmetic deformity of the neck, grows deep inside the upper chest, or narrows the windpipe or esophagus. 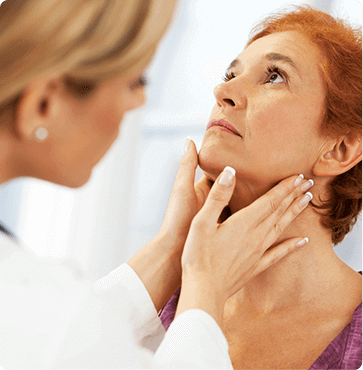 The highly skilled and experienced specialists at Austin ENT Clinic regularly diagnose and effectively treat thyroid problems. To discuss your surgical options, request an appointment online or call us at 1-800-876-EARS (3277) to arrange a private consultation.